I’m watching Donald Trump’s acceptance speech. And I’m finding it hard to concentrate. All I can focus on is those little fingers. You know the weird thing about this whole hand thing? I now look at men’s hands and wonder about their…you know, their…how do I say this without totally embarrassing myself? Okay, I’ll just say it…their ego size. I can’t help it. Is there a 12-step program for this problem? Not for me! For Donald Dinky Digits! I’m sure he would support some form of torture that would lengthen other men’s fingers. But I doubt anything could make Trump’s ego bigger. No. His ego is as super-sized as they come. Little hands. Little brain. Little heart. He. Cannot. Win. We have to all make sure of that!!!! I started focusing on those hands as well. They are weirdly hypnotic in a really bad way. Teeny, weeny, little sausages. Better than focusing on what he said! God help us all if he is elected. Our politics have been a joke for a while now, the outcome of votes in some areas still not known 3 weeks after our election. I can’t imagine how frustrating and infuriating the Trump farce is for you when it has been going on for so long and the garbage continues to pour out of his mouth. What on earth happened to our world? It seems to have gone crazy, so many people caught up in the fear and hype that Trump and others like him are peddling. So did those little fingers destroy your sexual fantasy with The Donald? I was just drawing a conclusion from your words. Actually, I’m longing for the days when we could just laugh at him. I no longer under estimate him — he could win just like he won the nomination. Terrifying as that is. Although I no longer under estimate him or the stupidity of voters, I continue to ignore him … he can win because HC definitely can lose. And because so many people want to lame someone else for their troubles. Did you know that research says that 92.683% of all problems are directly linked to Presidents FDR, Clinton, and Obama. Elyse. I am so with you on this. We must not be complacent–this horror story could win the presidency. I also happy Hillary chose Kaine. He is a really decent man. In the meantime, I’m hitting my knees in prayer, ’cause I cannot trust the electorate–we have lost our ever loving minds. It gets scarier every day. Pray hard! Really… you used just one hand? Did you notice that after the speech the room was full of so much hot air, it took a long time for the balloons to fall? 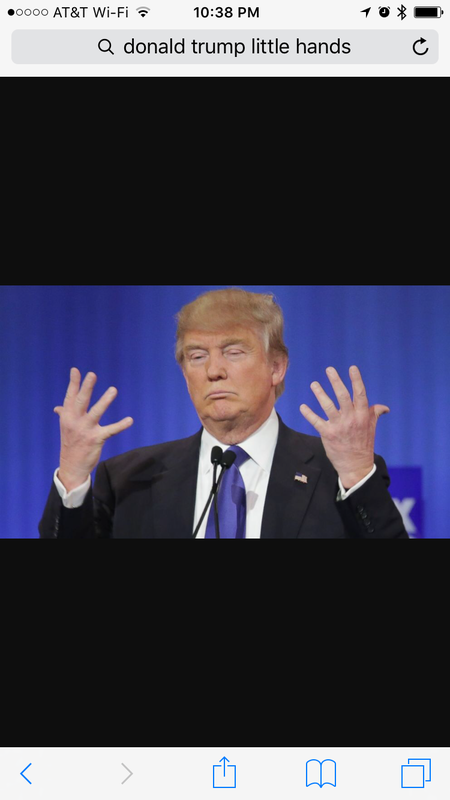 He hates it when you talk about the size of his hands. You’d better knock it off. Stolen but appropriate. What a mope-fest. Fear fest. I need to find where I saw that. He also does one of the things that really bugs me– clapped for himself as he entered. He is a narc. It probably eats him alive that his hands are so small and that people will talk about it. If elected, someone should point it out to him every day. I think Elyse could do it. She is awesome like that. And lives in the neighborhood. She wouldn’t have to go out of her way at all. If he wins, I will move to New Zealand — that’s as far away as I can get. Yeah, right. You and RBG. Who you two tryin’ to kid? Us or yourselves? Neither one of you are going ANYWHERE. Then Trump had better lose. Remember…all the prognosticators and deep thinkers said he’d never make it this far. And Hillary is a weak candidate. Anything can happen. Thanks for cheering me up mark. I could do that. I can’t not think it whenever I see him! I’m still stuck on the hair. But I’ve been avoiding news reports fro the US. Thanks so much for pointing out the hands. Good to see you — doing well? About the same. For us, it’s all relative, ain’t it. I watched a bunch of this speech last night, but kept nodding off. A few things kept coming back to me. First, the incredible smugness of this guy, like this is all some kind of game and he is the one winning, just look at him. Second, the condescension and insincerity, as though this really is an individual that will say whatever people want to hear. Third, and worst, the sheer volume of his lying. So many claims and promises about things he will make better because others have bungled them up so badly, treatsies on how he will make all these corrections and quickly – but no indication of how. His words seem so empty, as though he fully knows he’s lying, fully expects people to know he’s lying, but also fully expects that people will buy the lie. And I don’t know, maybe they will. I felt an incredible urge to fly to Cleveland and punch this guy in the nose. But then I feel asleep and dreamt about hot dogs and beer, and that is no lie at all. Only punch his nose? I kept hoping the ceiling would collapse. Oh, Elyse – you didn’t look at those tiny hands did you? Oh my, it’s too late now. I know. Can’t unsee something like that. I want to move to another country. Watch out, his tiny hands will reach you there, too. I’m watching and feeling sorry for all the fact checkers … there isn’t a server on the planet fast enough to keep up with these lies. I feel sick. How will I ever sleep over the next couple of months? It’s easier after you throw up.